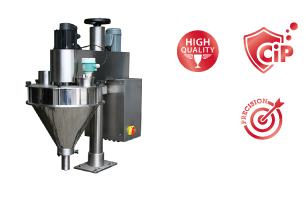 Eurofill volumetric Auger machines provide a cost effective powder filling solution. Our range covers weights from 10g to 25kg. The hoppers have agitators/stirrers with independent inverter controls to keep the powder free flowing and mixed if required. The hoppers can also be split for easy access clean in place (CIP).